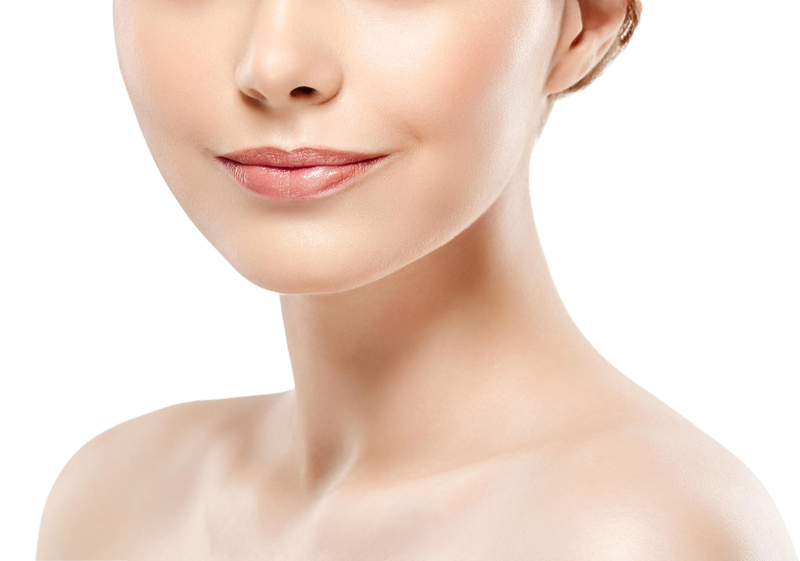 Chin augmentation, also known as mentoplasty, is a facial rejuvenation procedure that enhances the jawline. If the chin is too strong or too weak in proportion to the rest of the face, chin augmentation corrects this problem. Chin augmentation involves the use of a small surgical implant that consists of autologous bone collected from an individual’s pelvis or rib or the implant chosen may be synthetic. The implant is inserted in the front of the chin bone. Dr. Babak Azizzadeh of the CENTER for Advanced Facial Plastic Surgery is internationally renowned for his facial plastic and reconstructive surgery expertise. With chin augmentation, he strives to create a chin that is in perfect proportion with a patient’s other facial features. Enlargement: Involves the insertion of chin implants to supplement the existing bone at the front of the jaw. Submental Liposuction: Removes fat from the chin (submental fat under the chin) to improve the jawline and facial symmetry. Redeuction: If the chin is too prominent, it can be reduced. In some instances, Dr. Azizzadeh recommends chin augmentation be performed in conjunction with a rhinoplasty so that the chin and nose can be as complimentary and attractive as possible. Comparatively, some people may need lip augmentation and chin augmentation to achieve a balanced and vibrant facial appearance. Rhinoplasty, often referred to as a “nose job,” involves reshaping the nose or correcting structural defects of the nose. Thanks to rhinoplasty, an individual can reduce facial asymmetry, improve the shape and/or size of the nose and remove imperfections on the bridge of the nose. Lip augmentation is a cosmetic treatment that boosts the fullness of the lips. In many cases, an injectable dermal filler is used for lip augmentation. Dermal fillers often consist of hyaluronic acid, a substance that naturally occurs in the body. These fillers enhance the shape, structure and volume of the lips. When used in combination with chin augmentation, dermal fillers improve the overall facial appearance. Dr. Azizzadeh always takes a holistic approach to facial plastic and reconstructive surgery, regardless of whether a patient needs chin augmentation, lip augmentation, rhinoplasty or a combination of the three. He ensures any procedures that are performed create results in balance with the whole face. That way, Dr. Azizzadeh enables patients to optimize their cosmetic treatment results. Before undergoing chin augmentation, Dr. Azizzadeh evaluates a patient’s facial features and uses the “Aging Arc” tool to visualize an individual’s facial appearance relative to the natural aging process. Also, he examines a patient’s medical history. And if chin augmentation or any other procedures are deemed too risky, Dr. Azizzadeh offers alternative treatment options. Dr. Azizzadeh addresses a patient’s chin augmentation concerns and questions prior to treatment. He discusses the pros and cons of chin augmentation, and by doing so, helps patients make informed treatment decisions. To schedule a consultation with Dr. Azizzadeh, please call us at 310-657-2203.